For other uses, see Tuba (disambiguation). The tuba (/ˈtjuːbə/; Italian: [ˈtuːba]) (bass) is the largest and lowest-pitched musical instrument in the brass family. As with all brass instruments, the sound is produced by lip vibration into a large mouthpiece. It first appeared in the mid-19th century, making it one of the newer instruments in the modern orchestra and concert band. The tuba largely replaced the ophicleide. Tuba is Latin for 'trumpet'. In America, a person who plays the tuba is known as a tubaist or tubist. In the United Kingdom, a person who plays the tuba in an orchestra is known simply as a tuba player; in a brass band or military band, they are known as bass players. Prussian Patent No. 19 was granted to Wilhelm Friedrich Wieprecht and Johann Gottfried Moritz (1777–1840) on September 12, 1835 for a "bass tuba" in F1. The original Wieprecht and Moritz instrument used five valves of the Berlinerpumpen type that were the forerunners of the modern piston valve. The first tenor tuba was invented in 1838 by Carl Wilhelm Moritz (1810–1855), son of Johann Gottfried Moritz. The addition of valves made it possible to play low in the harmonic series of the instrument and still have a complete selection of notes. Prior to the invention of valves, brass instruments were limited to notes in the harmonic series, and were thus generally played very high with respect to their fundamental pitch. Harmonics starting three octaves above the fundamental pitch are about a whole step apart, making a useful variety of notes possible. Adolphe Sax, like Wieprecht, was interested in marketing systems of instruments from soprano to bass, and developed a series of brass instruments known as saxhorns. The instruments developed by Sax were generally pitched in E♭ and B♭, while the Wieprecht "basstuba" and the subsequent Cerveny contrabass tuba were pitched in F and C (see below on pitch systems). Sax's instruments gained dominance in France, and later in Britain and America, as a result of the popularity and movements of instrument makers such as Gustave Auguste Besson (who moved from France to Britain) and Henry Distin (who eventually found his way to America). An orchestra usually has a single tuba, though an additional tuba may be requested. It serves as the bass of the orchestral brass section and it can reinforce the bass voices of the strings and woodwinds. It provides the bass of brass quintets and choirs (though many small brass ensembles will use the euphonium or bass trombone as the lowest voice). It is the principal bass instrument in concert bands, brass bands and military bands, and those ensembles generally have two to four tubas. It is also a solo instrument. Tubas are used in marching bands, drum and bugle corps and in many jazz bands (see below). In British style brass bands, two E♭ and two B♭ tubas are used and are referred to as basses. Concertos have been written for the tuba by many notable composers, including Ralph Vaughan Williams (Tuba Concerto), Edward Gregson, John Williams, Alexander Arutiunian, Eric Ewazen, James Barnes, Joseph Hallman, Martin Ellerby, Philip Sparke, Kalevi Aho, Josef Tal, Bruce Broughton (Tuba Concerto) and David Carlson. Tubas are found in various pitches, most commonly in F, E♭, C, or B♭. The main tube of a B♭ tuba is approximately 18 feet (5.5 m) long, while that of a C tuba is 16 feet (4.9 m), of an E♭ tuba 13 feet (4.0 m), and of an F tuba 12 feet (3.7 m). The instrument has a conical bore, meaning the bore diameter increases as a function of the tubing length from the mouthpiece to the bell. The conical bore causes the instrument to produce a preponderance of even-order harmonics. A tuba with its tubing wrapped for placing the instrument on the player's lap is usually called a concert tuba or simply a tuba. Tubas with the bell pointing forward (pavillon tournant) instead of upward are often called recording tubas because of their popularity in the early days of recorded music, as their sound could more easily be directed at the recording microphone. When wrapped to surround the body for cavalry bands on horseback or marching, it is traditionally known as a hélicon. The modern sousaphone, named after American bandmaster John Philip Sousa, resembles a hélicon with the bell pointed up (in the original models as the J. W. Pepper prototype and Sousa's concert instruments) and then curved to point forward (as developed by Conn and others). Some ancestors of the tuba, such as the military bombardon, had unusual valve and bore arrangements compared to modern tubas. Most music for the tuba is written in bass clef in concert pitch, so tuba players must know the correct fingerings for their specific instruments. Traditional British-style brass band parts for the tuba are usually written in treble clef, with the B♭ tuba sounding two octaves and one step below and the E♭ tuba sounding one octave and a major sixth below the written pitch. This allows musicians to change instruments without learning new fingerings for the same written music. Consequently, when its music is written in treble clef, the tuba is a transposing instrument, but not when the music is in bass clef. The euphonium is sometimes referred to as a tenor tuba and is pitched in B♭, one octave higher than the BB♭ contrabass tuba. The term "tenor tuba" is often used more specifically to refer to B♭ rotary-valved tubas pitched in the same octave as euphoniums. 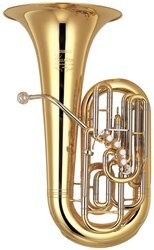 The "Small Swiss Tuba in C" is a tenor tuba pitched in C, and provided with 6 valves to make the lower notes in the orchestral repertoire possible. The French C tuba was the standard instrument in French orchestras until overtaken by F and C tubas since the Second World War. One popular example of the use of the French C tuba is the Bydło movement in Ravel's orchestration of Mussorgsky's Pictures at an Exhibition, though the rest of the work is scored for this instrument as well. Larger BBB♭ subcontrabass tubas exist, but are extremely rare (there are at least four known examples). The first two were built by Gustave Besson in BBB♭, one octave below the BB♭ Contrabass tuba, on the suggestion of John Philip Sousa. The monster instruments were not completed until just after Sousa's death. Later, in the 1950s, British musician Gerard Hoffnung commissioned the London firm of Paxman to create a subcontrabass tuba in EEE♭ for use in his comedic music festivals. Also, a tuba pitched in FFF was made in Kraslice by Bohland & Fuchs probably during 1910 or 1911 and was destined for the World Exhibition in New York in 1913. Two players are needed; one to operate the valves and one to blow into the mouthpiece. Tubas are made with either piston or rotary valves. Rotary valves, invented by Joseph Riedl, are based on a design included in the original valve patents by Friedrich Blühmel and Heinrich Stölzel in 1818. Červeny of Graslitz was the first to use true rotary valves, starting in the 1840s or 1850s. Modern piston valves were developed by François Périnet for the saxhorn family of instruments promoted by Adolphe Sax around the same time. Pistons may either be oriented to point to the top of the instrument (top-action, as pictured in the figure at the top of the article) or out the front of the instrument (front-action or side-action). There are advantages and disadvantages to each valve style, but assertions concerning sound, speed, and clarity are difficult to quantify. German players generally prefer rotary valves while British and American players favor piston valves; the choice of valve type remains up to the performer. Some tubas have a strong and useful resonance that is not in the well-known harmonic series. For example, most large B♭ tubas have a strong resonance at low E♭ (E♭1, 39 Hz), which is between the fundamental and the second harmonic (an octave higher than the fundamental). These alternative resonances are often known as false tones or privileged tones. Adding the six semitones provided by the three valves, these alternative resonances let the instrument play chromatically down to the fundamental of the open bugle (which is a 29 Hz B♭0). The addition of valves below that note can lower the instrument a further six semitones to a 20 Hz E0. Thus, even three-valved instruments with good alternative resonances can produce very low sounds in the hands of skilled players; instruments with four valves can play even lower. The lowest note in the widely known repertoire is a 16 Hz double-pedal C0 in the William Kraft piece Encounters II, which is often played using a timed flutter tongue rather than by buzzing the lips. The fundamental of this pitch borders on infrasound and its overtones define the pitch in the listener's ear. Some tubas are capable of being converted into a marching style, known as "marching tubas". A leadpipe can be manually screwed on next to the valves. The tuba is then usually rested on the left shoulder (although some tubas allow use of the right shoulder), with the bell facing directly in front of the player. Some marching tubas are made only for marching, and cannot be converted into a concert model. Most marching bands opt for the sousaphone, an instrument that is easier to carry and almost always cheaper than a true marching tuba. The earlier helicon is still used by bands in Europe and other parts of the world. Drum and bugle corps players, however, generally use marching tubas or Contrabass bugles. Standard tubas can also be played whilst standing, with the use of a strap joined to the tuba with two rings. The strap goes over the shoulder like a sash, so the musician can play the instrument in the same position as when sitting. The tuba has been used in jazz since the genre's inception. In the earliest years, bands often used a tuba for outdoor playing and a double bass for indoor performances. In this context, the tuba was sometimes called "brass bass", as opposed to the double bass (string bass). Many musicians played both instruments. In modern jazz, tubas usually fill the traditional bass role, though it is not uncommon for them to take solos. New Orleans style brass bands like the Dirty Dozen Brass Band and the Rebirth Brass Band use a sousaphone as the bass instrument. Bill Barber played tuba on several Miles Davis albums, including Birth of the Cool and Miles Ahead. New York City-based tubist Marcus Rojas performed frequently with Henry Threadgill. ^ "tuba definition - Latin Dictionary". www.Latin-Dictionary.org. Retrieved 4 February 2018. ^ "Vienna Symphonic Library". www.vsl.co.at. Retrieved 2017-09-22. ^ "Compensating System". www.Dwerden.com. Retrieved 4 February 2018. Chisholm, Hugh, ed. (1911). "Bombardon" . Encyclopædia Britannica (11th ed.). Cambridge University Press.